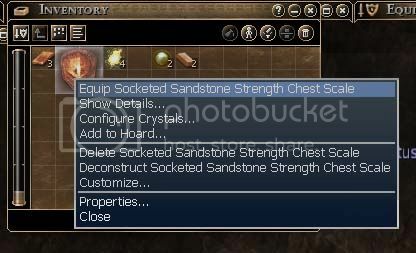 The dragon trainers seem to think you are ready to learn another important crafting technique – adding a socket to something – in this case, a sandstone strength chest scale. 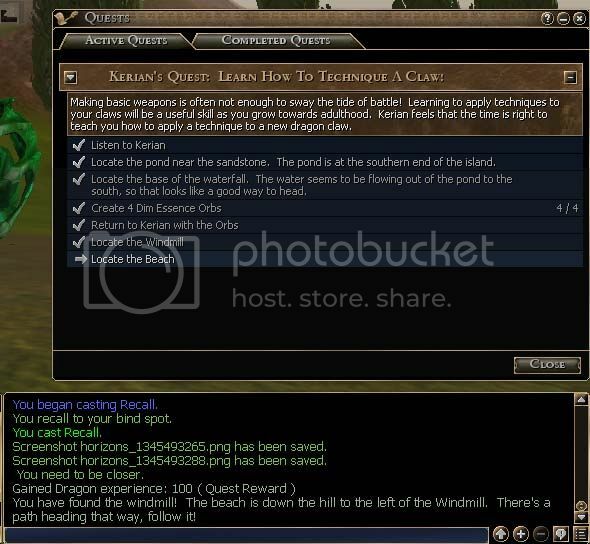 Once you greet kerian, you listen to the quest information and as always, check your quest journal. You have a choice – not much of one, but nevertheless – do you do the dims first, or the bronze? I choose to do the dims first. You should already know how to get to them and make them, of course, so I will forebear to repost that, in the interest of interest, as well as the bronze. 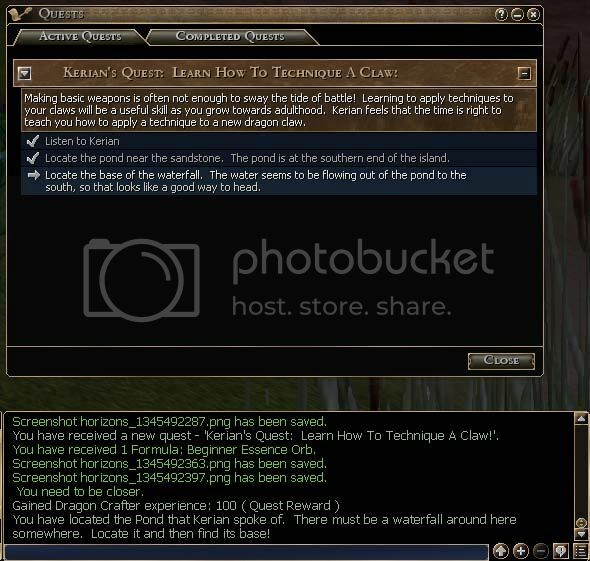 Your quest journal and chat logs will update with each step, as usual. 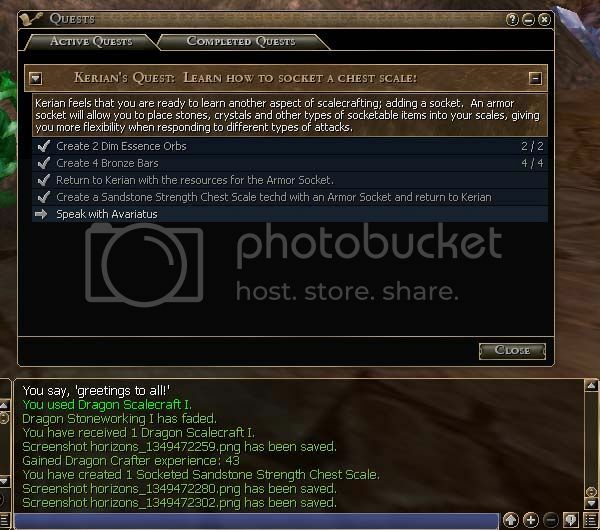 When you return to kerian, the dragon acknowledges your work and give you the technique formula for a socket, instructing you to return with a socketed chest scale. Scribe the formula as normal. Now, If you don’t have them in your vault (which I didn’t), you need to head to the sandstone field by pratt’s pond and make the needed sandstone bricks for the chest scale. 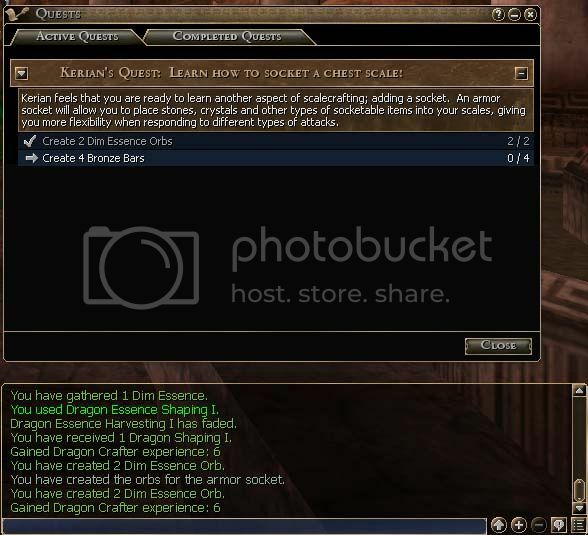 Once you have enough, head back to the dragon crafter’s cave and use the scale forge to make the scale. Don’t forget to add the socket technique before you make it! 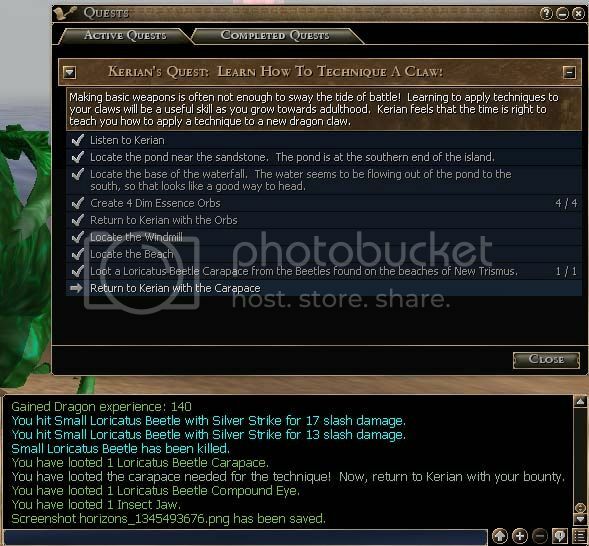 Take a couple steps back and talk to kerian. 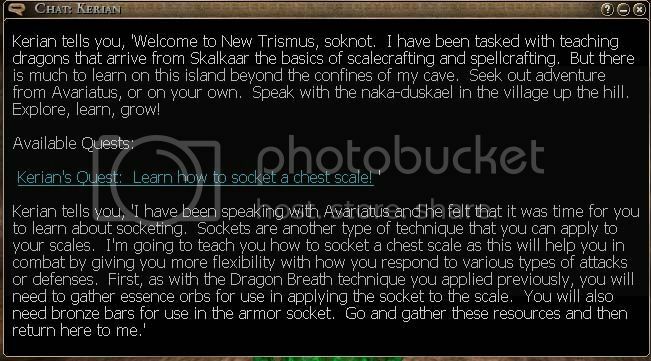 The dragon crafter advises you to go speak with avariatus, who might have something to put in the socket! Before you go, you might want to equip your new scale. 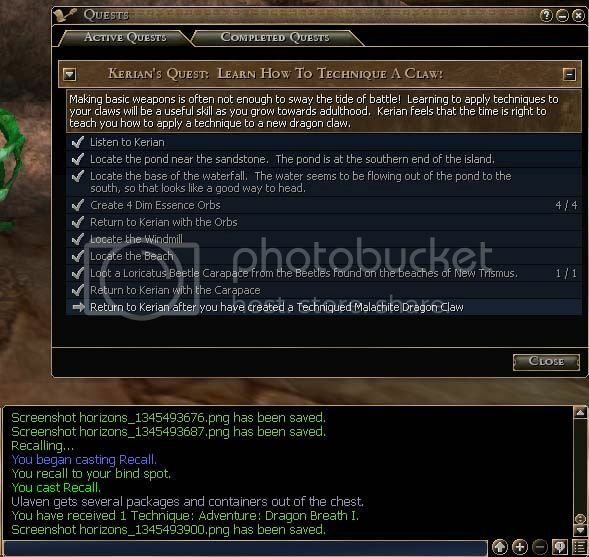 Simply choose it in your inventory, right click, choose the equip option, and there you go! 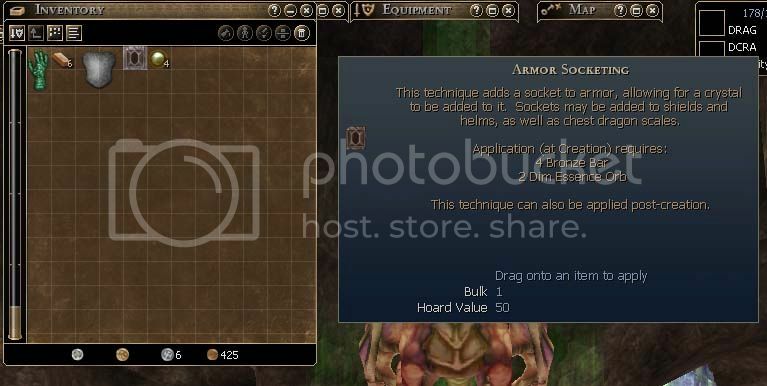 Your equipment screen will show you its current location. Feel free to add your old scale to your hoard, if you wish, or place it in your vault. Or give it to a newbie! 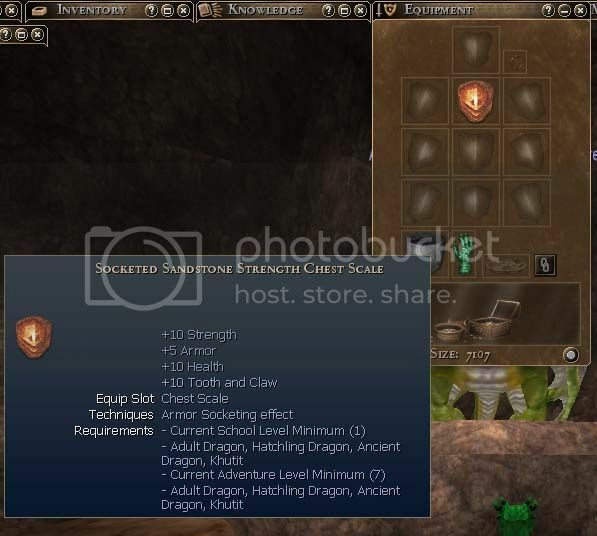 Gird yourself for battle, as the dragon adventurer likes to see flesh under your claws! Find out all about it next time! i got a personal invite to nia's autumn party on blight. after all the crafting and working on the plot, i deserve a little r&r! i had to work yesterday, so unfortunately i missed the main festivties, but i still got there in time for some good fun! when i logged on, the party was playing with son of gigaroth, arguably the nastiest nasty in the game. one hit from him is usually enough to put even the highest level alt down. so, as i was already in cleric skewl, i decked myself out in my best battle armor, loaded up my resurrections and my most awesome spells, grabbed opener (my trusty warhammer - because you might not be able to use a sword on something, but everything succumbs to having the snot beat out of them) and my fave shield (i am thinking of calling it coulson, what do you think? 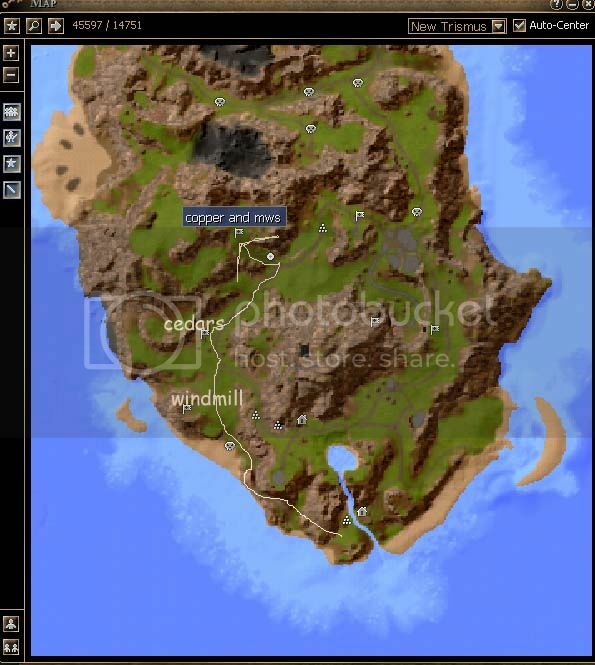 ;-} ), and ported to mithral's anvil, the closest port to the settlement of old oaks, where nia had a haunted themed plot, and the imperial outpost - both on the very edge of the harro deadlands. thanx to a blight anchor, the area is usually swamped with baddies, and soggy (as he is affectionately known) was in full party mode. several group members were down, and i decided to wade in with those remaining standing and try to bring soggy down before rezzing the fallen. this was not a wise choice. i thnk i managed to get in maybe one swing while he was busy before being swatted like the gnat i was. i was rezzed and almost immediately killed again! this time, i recalled and ran back, hoping to sneak up on a fallen friend and rez before soggy found us. this was not to be, however! soggy was waiting for me on the road, and before i could turn and run away, he nailed me again! soggy seemed to back off for a bit, and we rezzed the group and headed back to the plot to recover. we thought were safe there, but boy, we were wrong. one minute we are discussing what to do next, then soggy was in the middle of us, rampaging away. and you guessed it, i died yet again! if you are keeping count, that's 4 death points. 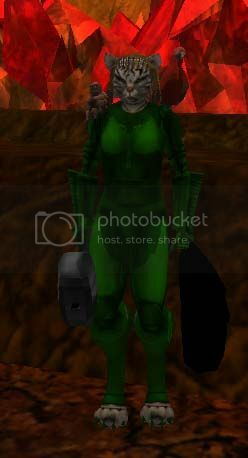 this time, after rezzing and/or recalling, we decided to head to nia's plot at north crystal on shepherd's mountain. she has a tier 6 tavern and i had a lot of food. 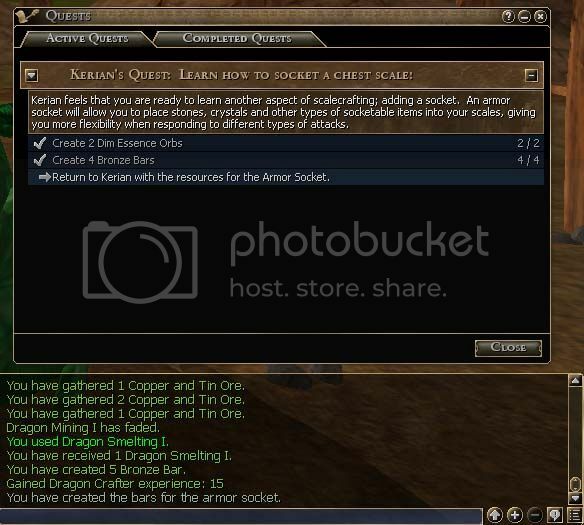 you can eat food at any time and any where and get a reduction on the death penalty time, but eating a full meal in a tavern can decrease the time to a vast degree - a full meal, consisting of an appetizer, side dish, main dish, and a dessert, eaten in a t6 tavern, reduced one full dp for me. so, the remainder of the party was spent feasting and chatting with one of the gods of istaria, sooty kins, who happened by. the party is over, but ranq reminded me that i hadn't been on a pilgrimage to the lost god illy's mountaintop plot in a very long time. once, long ago, blight had it's very own god, illyist. 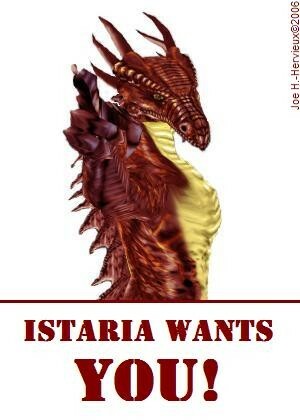 during the time of trouble, we lost him, but the current gods of istaria have kept his good worx, in homage. 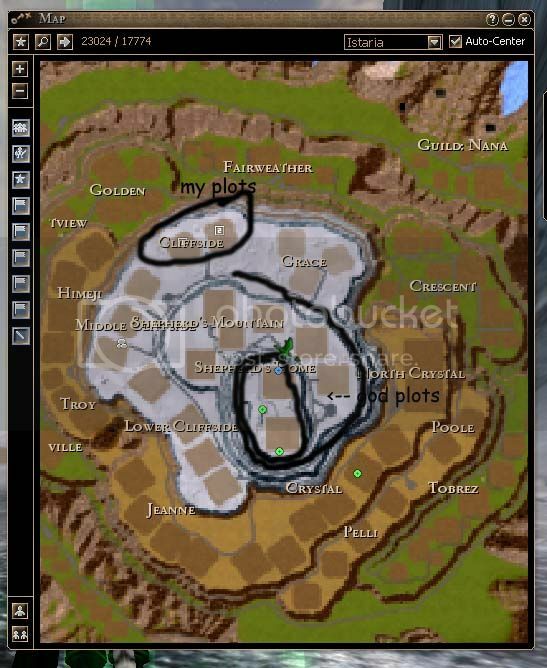 in fact, shepard's mountain is considered 'holy' by the elders of horizons - it's the major reason i built the palace and industrial complex in middle cliffside. i believe the middle cliffs port is the closest one to illy's most holy shrine! even with that, it is a very long and winding run up the mountain to get to the shrine. 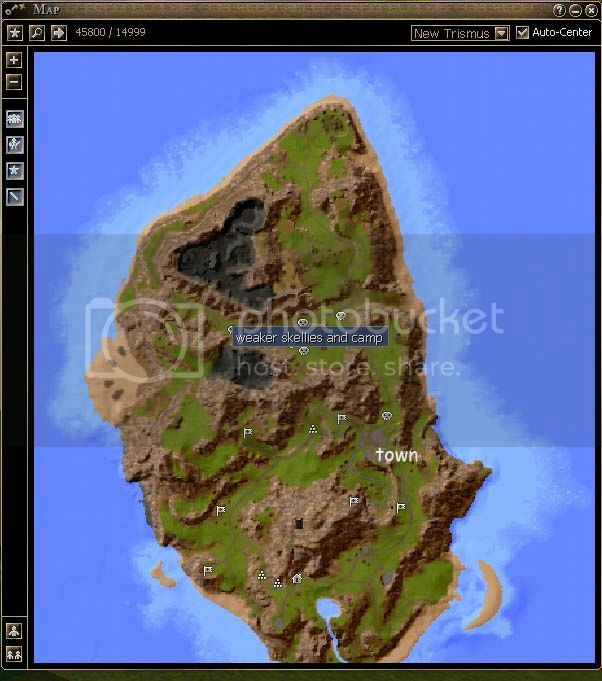 once you get there, you see that the shrine is still as illy left it, incomplete buildings and all. i spent a good few minutes wandering around in memory, then went back home, got back into my crafting duds, and recalled back to dralk, ready to get back to the cobalt construction. and that's how i spent my saturday! i promise, we will get right back to the dragon quests next time! see ya then! a non istaria related post, how about that? taking a horizons break to let you in something you readers of fantasy fiction might want to know about. if you are like me, you are already well aware of the great and mighty larry elmore. and you love his work above all others.  if so, you need to get in on this! well, it's time to get this teched claw made! after you get your orbs and carapace, it remains only to gather the needed materials to make the claw itself. you need bronze and malachite. you should be very familiar with finding and making bronze bars. don't forget to check your vault for stragglers, that's how i saved having to fetch and make bronze. 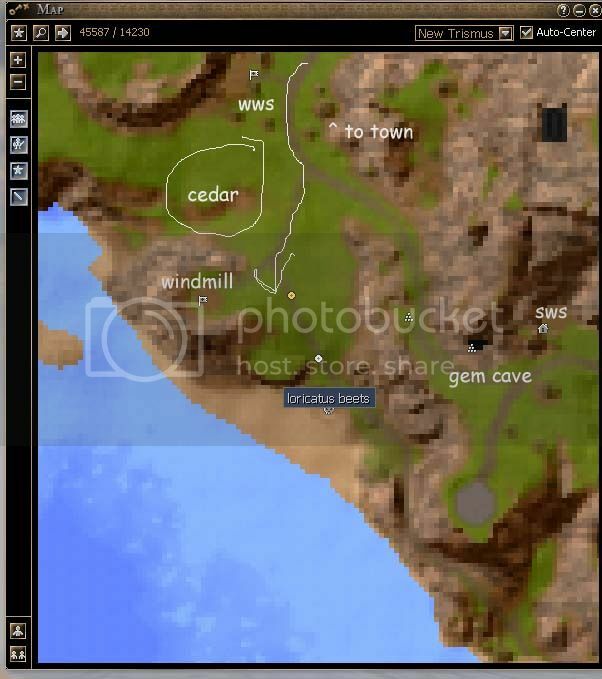 you also should be familiar with the way to the gem cave and gws. if you need a refresher, here it is. however, chances are very good that you will not find malachite in the first cave, or if you do, it will not be enough. you will need to go into the second cave to find some. just head down the corridor at the back of the first cave. it's a bit of a run, but eventually you will end up in the second cave. you should find plenty of malachite here, including a motherload and a rich node. gather the needed uncut malachite and head back up the corridor to the main cave, out to the road and on to the gws to make the cut gems. 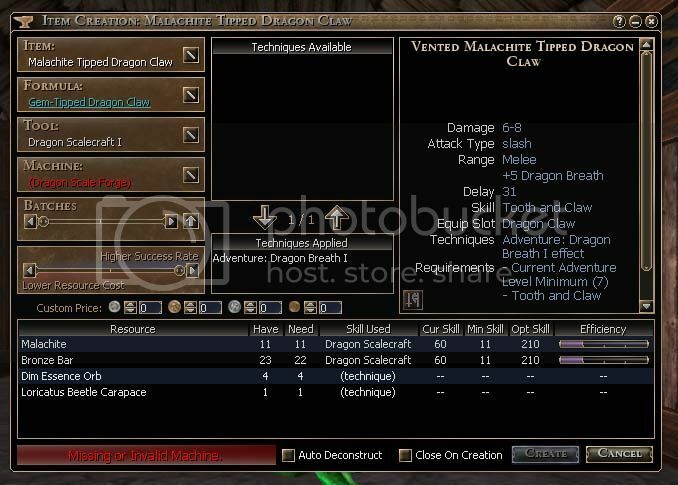 once you have all the materials you need (bronze bars, cut malachite, dim ess orbs, and beetle carapace), head back to the dragon crafter's cave [i use recall, but run if you like! ;-} ]. 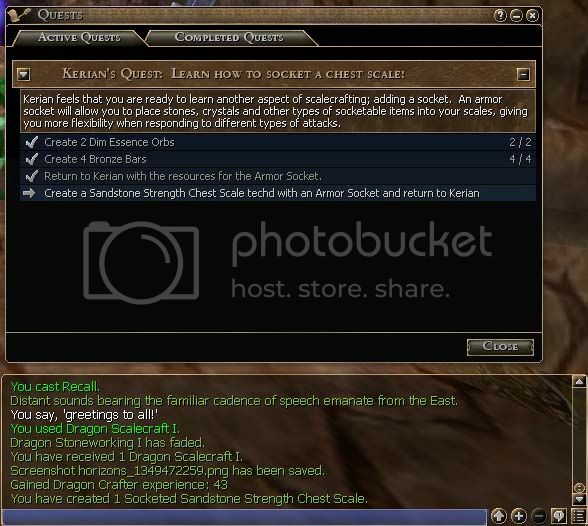 i am sure you remember where the scale forge is, directly behind and to the right of kerian's pedestal. 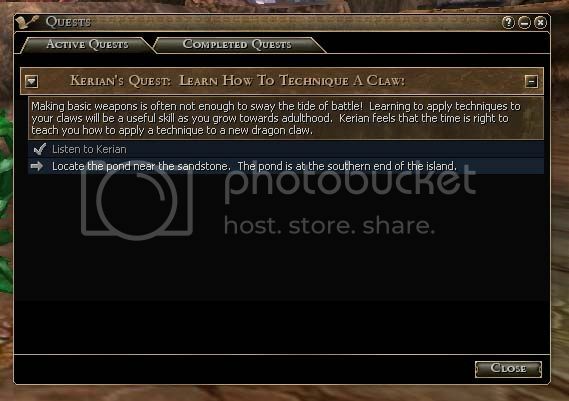 bring up your claw form, choose the dragon's breath technique from the list at the top middle of the screen and click the down arrow underneath to add it to the creation requirements, then proceed to make the new claw. 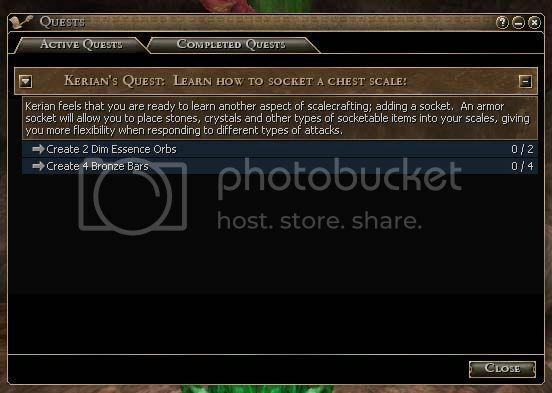 take a couple steps back and talk to kerian to get your pat on the head. and that's all there is to it!! make sure you equip the claw, tell you why next time! well, that brief interlude was fun, but now it's back to work time! 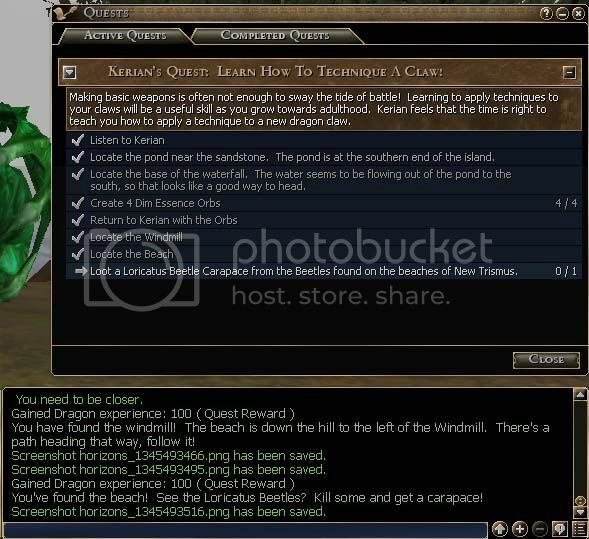 if you remember, the dragon adventure trainer has sent you back to kerian for your next quest. this is a long one, so i will be breaking it up into at least 2 parts. 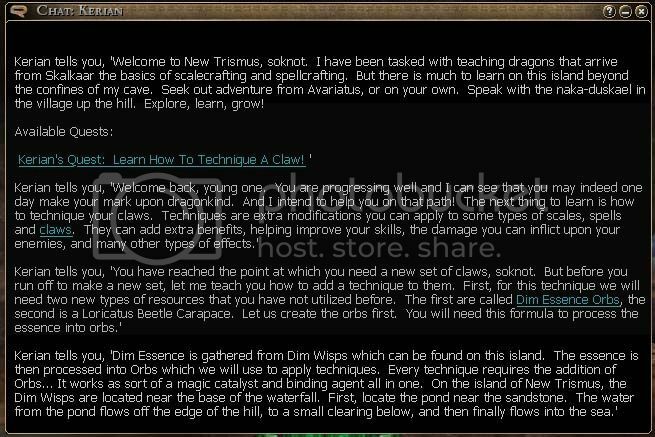 when you greet the dragon craft trainer, you are instructed to first find and then harvest some dim essence. 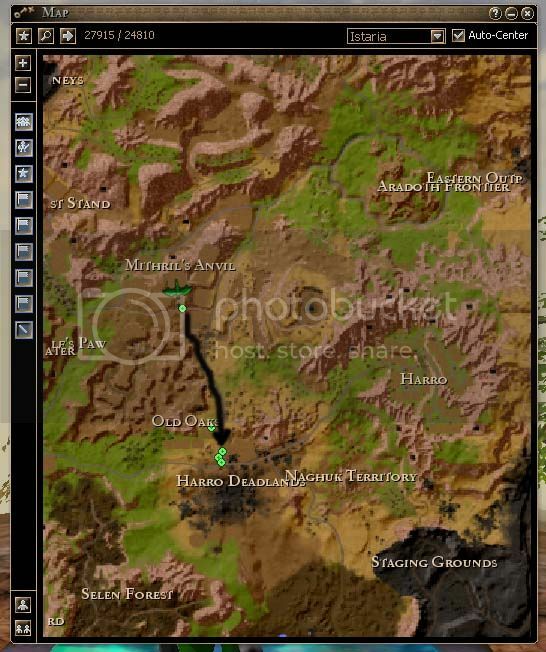 by now, if you haven't found it already, you should be familiar enough with the area to locate them easily. 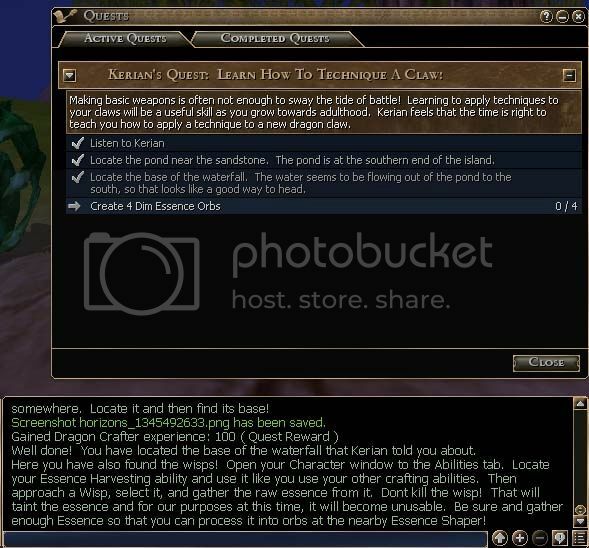 however, this quest requires trigger points - you will need to take the proper 'long' way, per instructions. first step is to head to the sandstone field and pratt's pond. 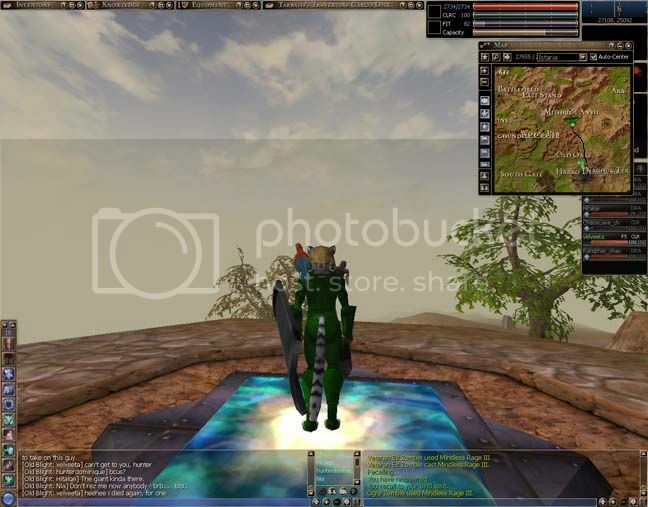 approach the pond and run around the shore until the trigger tells you that you found the pond (the pond is located at the bottom of the screenie, if you aren't familiar with it already). run toward the edge of the waterfall and head down. if you have the gliding option enabled, you can jump off and glide to the clearing below, or you can just fall down and end up in the stream between the essence work station and the field with the dim wisps. 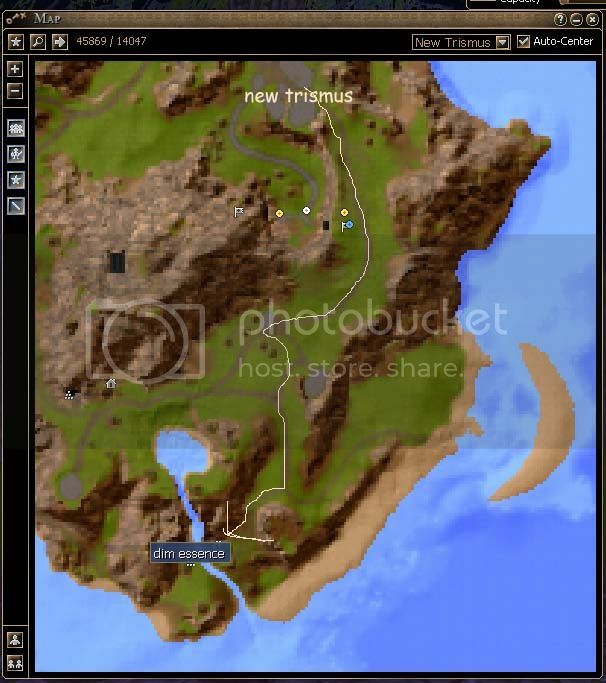 harvesting the wisps is basically the same as gathering any other resource. 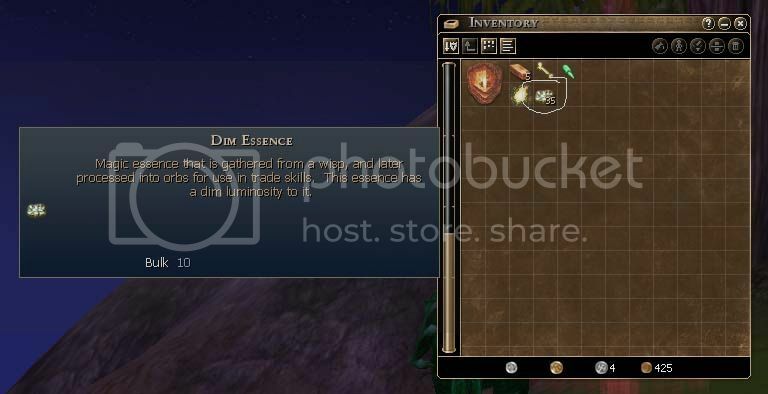 choose a wisp (they move, so you have to stay with them until you start harvesting), activate your essence harvesting ability, harvest the wisps and use the convenient ews to make the needed orbs. 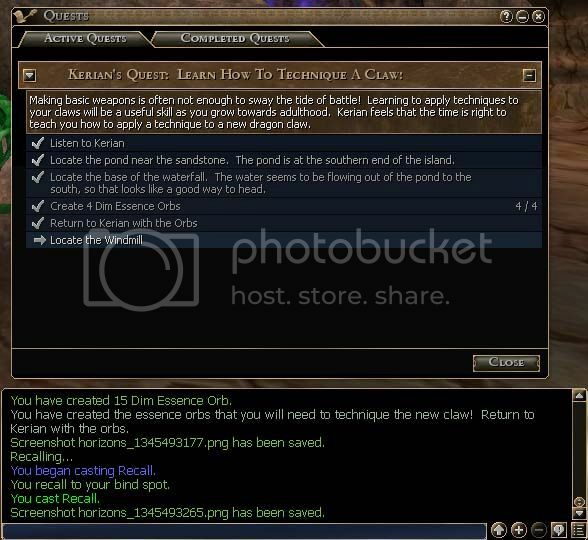 your quest journal and chat log will update when you have enough. 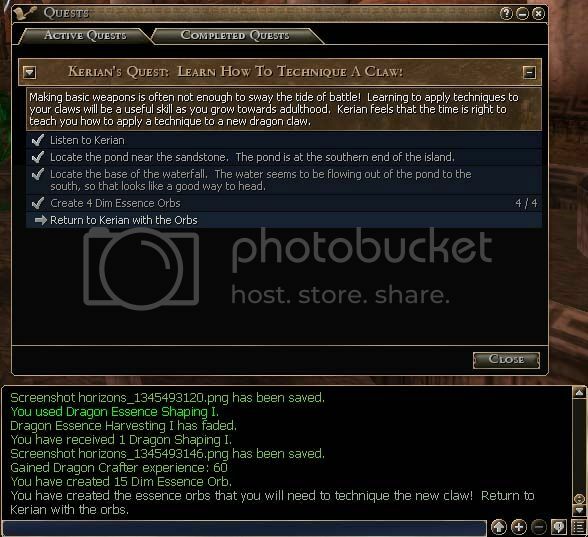 return to kerian for your next step in the quest. see, you get to beat up on some beets while crafting something!! see you soon to show you how to get a beet carapace!